Nowadays dentists, orthodontists and other dental professionals are able to address virtually any type of dental condition that patients suffer from. No matter whether patients have crooked teeth, are missing teeth and so on, there is a procedure that can restore almost anyone’s smile. However, in order for dental professionals to be able to achieve a patient’s dental goals, they must employ the assistance of certain dental tools. In order to address many dental conditions, dentists must use dental appliances. Basically, dental appliances are any type of structures that are placed within the mouth to address dental conditions. Not only are they used to repair teeth, but they can also be used to replace missing teeth and even assist with dental problems caused by other health conditions, such as sleep apnea. There are numerous types of dental appliances, some of which consist of plates, retainers and braces and others of which consist of crowns, caps and fillings. Night guards are also common dental appliances that are used to prevent patients from grinding their teeth at night and that can help with sleep apnea problems. Perhaps one of the most common types of dental appliances is braces. Both children and adults can have braces affixed to their teeth, and the most traditional type of braces is made of metal. Brackets are affixed to the teeth, and then a wire is run through the brackets and tightened periodically to coax the teeth into moving into their proper positions. Some braces require additional dental accessories like bands that connect the top and bottom braces together to help address overbites. In today’s modern world, though, braces are a type of dental appliance that doesn’t necessarily have to be constructed of metal. There are also clear aligners available on the market as well that are constructed of plastic for those braces wearers who don’t want their braces to be as noticeable as they would be if there were wearing traditional metal braces. In some cases in which braces alone aren’t sufficient enough to address a patient’s dental issues, headgear is another type of dental appliance that might be used in orthodontic treatment. Headgear can not only address the issues with the teeth that braces does, but it can also address issues with jaw alignment and other serious dental conditions. Headgear is usually attached to the braces at the back of the head and can be removed when needed. It works in essentially the same manner as rubber bands, but this type of dental appliance is primarily used when more extreme force is needed to align the teeth and jaws. Usually, this type of dental appliance only has to be worn at night when sleeping. Retainers are the dental appliance that patients are usually required to wear after they have their braces removed. This consists of dental plates that have a single wire that runs across them and over the teeth to hold them in place and prevent the teeth from shifting back into their original positions. This type of dental appliance is extremely important after having braces because it makes sure that the braces treatment was not for naught. Without wearing a retainer for 6 months to a couple of years (whatever the orthodontist prescribes), the shifted teeth might not hold their positions. Patients who have dental appliances have a responsibility to care for them and keep them properly cleaned not only in order to ensure that their appliances last, but also to ensure that they preserve their overall dental health. Letting dental appliances remain dirty can lead to further dental conditions like infections and gum disease. 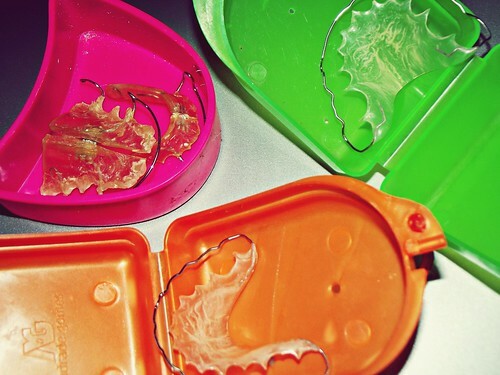 Some of the most common measures patients can take to care for their dental appliances are brushing and flossing regularly, rinsing and cleaning their appliances daily as instructed by their dentists and avoiding foods and other substances that could potentially break their appliances, such as extremely sticky candies like caramels and taffies. American Sleep Apnea Association. “Oral Appliances.” Retrieved on February 23, 2016, from http://www.sleepapnea.org/treat/treatment-options/oral-appliance.html. American Dental Association. “Braces and Orthodontics.” Retrieved on February 23, 2016, from http://www.ada.org/~/media/ADA/Publications/Files/ADA_PatientSmart_Braces.ashx.